Trail cooking. Just the sound of that short sentence conjures up visions of cast iron pots strung over a smoky campfire and an old two gallon coffee pot settled onto a bed of hot coals… at least to me it does. 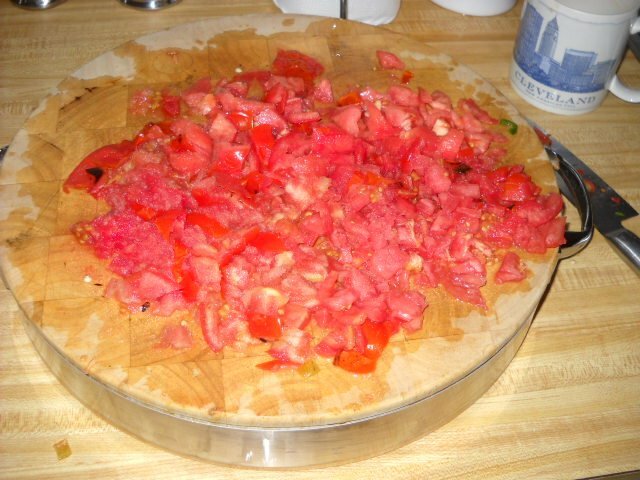 I once had a previous post on trail cooking on my now deleted Myspace account. Instead of drawing the folks I had intended it for, somehow it drew the back packers crowd. While I have nothing against back packers, it seemed they had ‘green’ issues with me regarding open fires and meat. 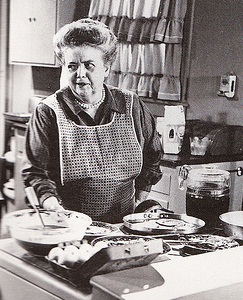 Since I and my cooking style didn’t fit their mold of what trail cooking is, I received a number of rude and opinionated comments. 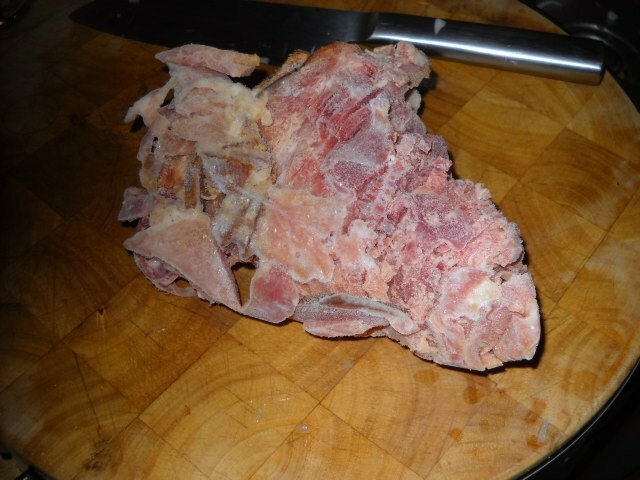 So, hopefully those reading this Heritage and trail cooking blog are more attuned to what I consider trail cooking. 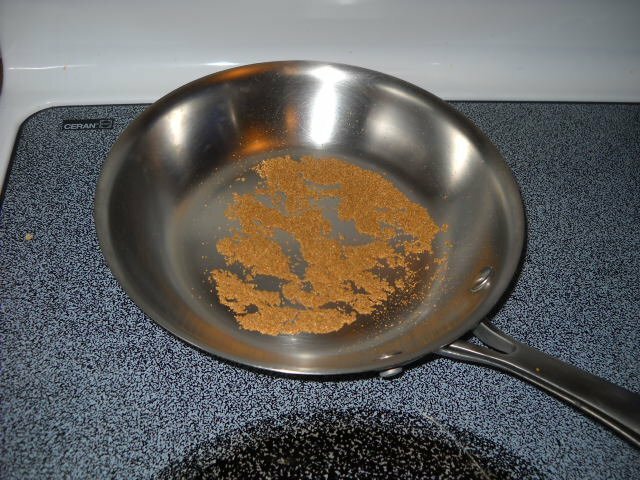 First, unlike the back packing crowd, my idea of trail cooking is not cooking rehydrated pouches of pasta alfredo in micro sized aluminum pans over even smaller Swedish alcohol stoves. 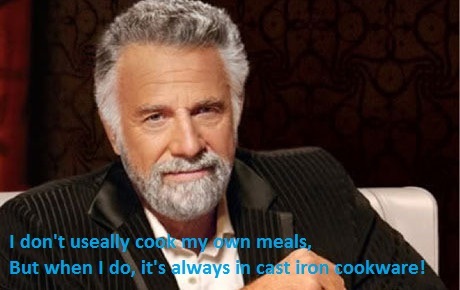 If yours is, then instead of acting high and mighty and scowling at you, I want to instead educate and teach you about the wonderful world of cooking full meals outdoors while on the move. 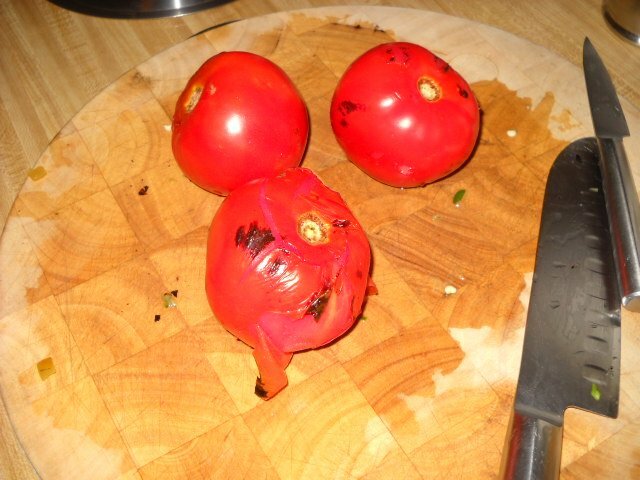 In this post, I’m going to show you some handy items for the beginner trail cook. 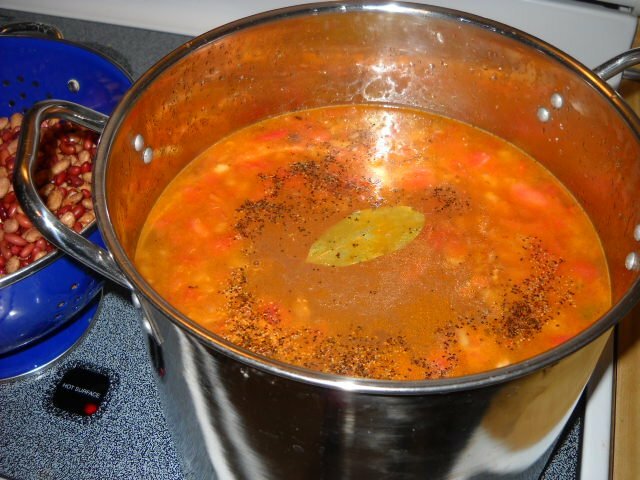 In other post, I’ll go through other great outdoor cooking equipment, how to use them like a pro and give you cooking tips on stews, meats, veggies, biscuits breads and more. By the time I’ve finished my different post on these subjects, you’ll have enough information to confidently step into the role as a real trail cook. 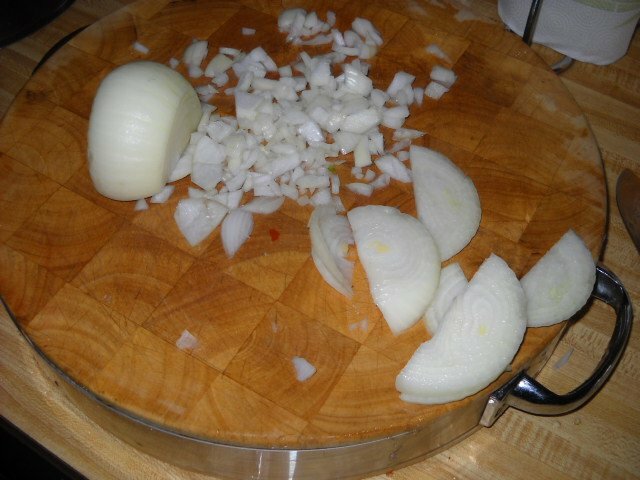 But first, let’s look at what trail cooking is and give you a beginners guide to some basic equipment. Trail cooking is a method of cooking ‘on the run’. 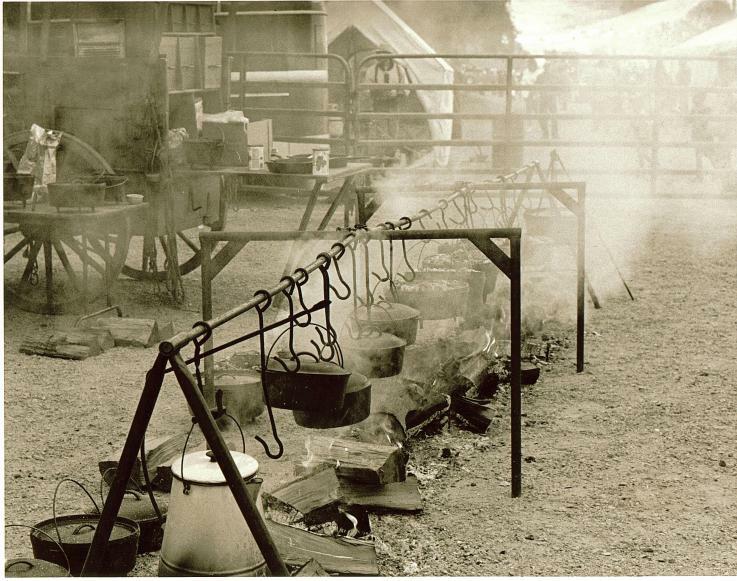 While some ranch cooks have permanent outdoor fire rings with iron pot hanger bars in place (as shown in picture above), we are going to talk about a short term set up. Trail cooking is similar to camp fire cooking except that when you trail cook, you set up your cooking process in a way that you make and store a bulk amount of ingredients for future use while on the move. I’ll explain. 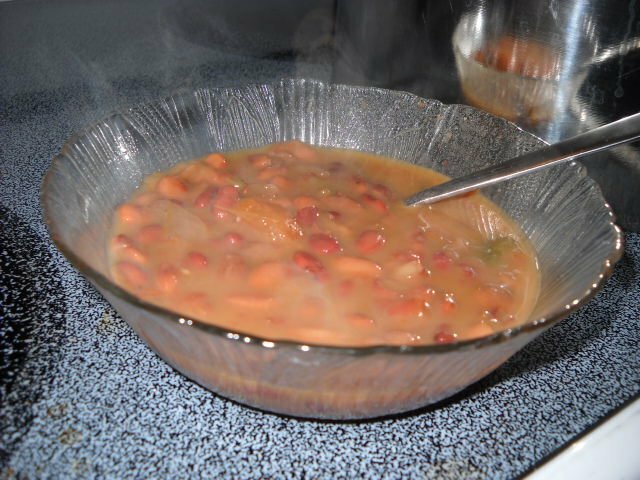 If you are making cowboy beans each night, you would not start from scratch each time you made them. 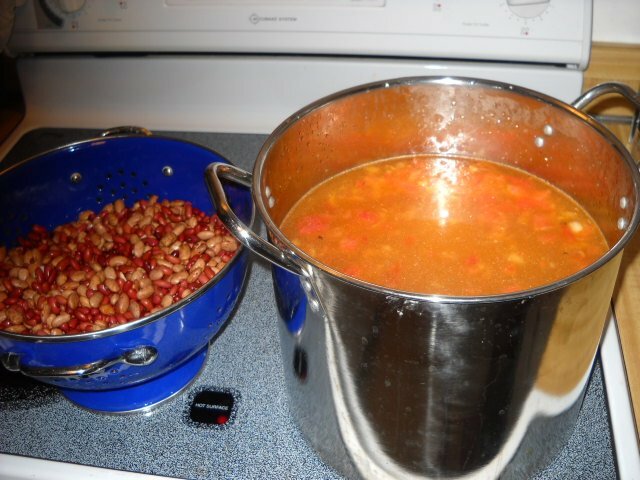 Instead, you would go ahead and prepare a bulk amount of soaked and boiled beans that could last 2-3 days. Such things like vegetables and spices are not included in the bulk amount being cooked as they are added as each days meal are made. 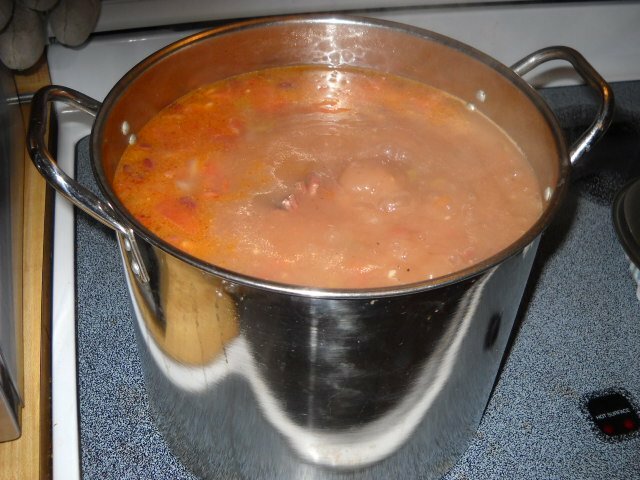 After the bulk amount of beans are boiled up, the amount you need for future meals is then separated and stored for another days meals. The trick is to store them correctly to inhibit them from turning rancid on you. 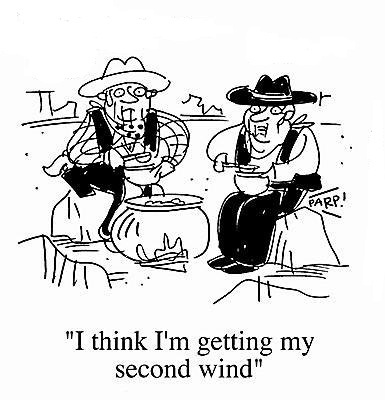 Boiled beans for instance can be drained fairly dry and stored in cloth sacks for a day or two more with no ill effect. 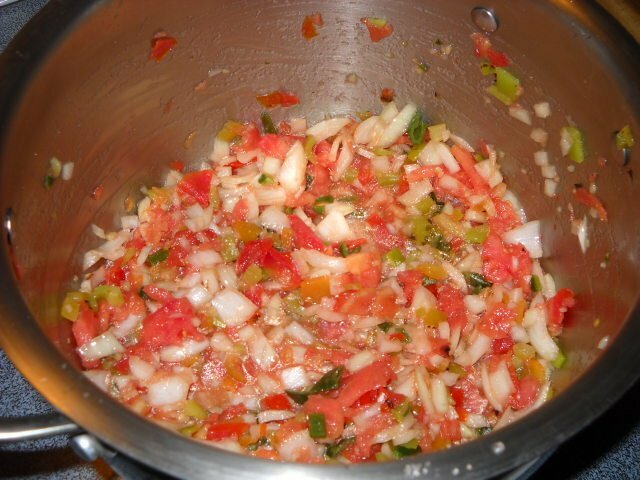 By doing this, you no longer have to do daily overnight soaks and then boil them at each meal until they’re soft. Sour dough biscuits and breads are another part of the meal that should be set up for multiple days meals. The sour dough starter is made in bulk and a certain amount is then drawn off and added to each batch of fresh dough. 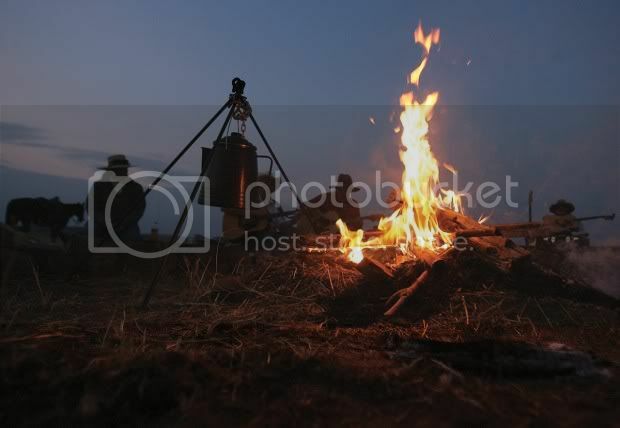 The whole idea of trail cooking is that you can move your camp yet easily set up and quickly start cooking once stopped. 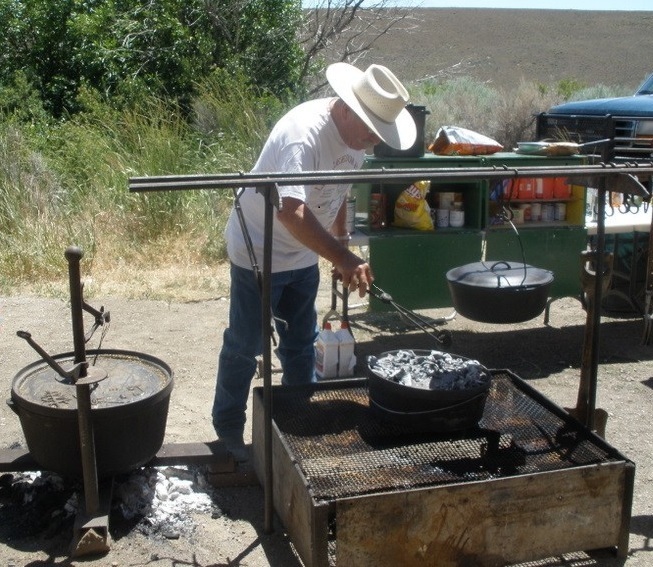 The Chuck Wagon was a portable kitchen that traveled ten to fifteen miles each day. First the fires. I use two different fire set ups depending on the way I’m cooking and equipment I’m going to use. One is the teepee and the other is the log cabin or criss cross method. Each fire starts with a center of very flammable material called tinder. 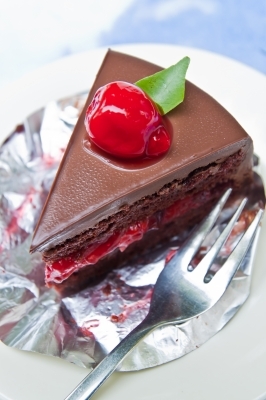 This can be paper, or carbonized cloth. * around that material can be loosely placed cardboard, dried grass etc. Then covering that are loosely placed twigs from pencil to finger thickness. (Loosely placed is the prime word here.) From this point you can decide what type of fire you wish to cook on and how big you want it to be. The first is the Teepee fire. This is a fire that concentrates the flame and heat to a single point located in the center of the fire. Placed on end with all its upper tips meeting in the center above and around the tinder fire, you again start with thinner branches or split wood. Each layer of wood becomes thicker until your pieces are 4-6 inches in diameter. Leave a small opening in the side that leads directly into the center of the tinder area. Using a twig with paper or dried grass wrapped around the end of it, light it and place it into the tinder. Add split wood or logs as needed. This is the quickest to start and hottest form of cook fire. An evening campfire is usually a teepee style. The second is the criss cross or log cabin fire. Start again with the same tinder method as the teepee fire uses. 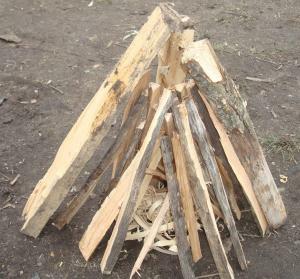 Similar to building a cabin with Lincoln logs, build a four square structure using pencil thin twigs, making sure to lay each twig on the end of the twig next to it. When the height is just above that of your tinder fire place a row of “roof” twigs (pencil to finger thickness) loosely across the top, like a roof. Place another loosely built wall of twigs and thin branches around the original cabin making sure you leave an entry way intact for lighting your tinder. Each wall of surrounding “Lincoln logs” should be thicker until they reach a 4-6 inch thickness. After lighting, this fire is meant to burn down into a hot burning coal bed. Add to the fire to increase the intensity of the hot coals by laying consecutive thin and thick pieces of firewood flat across the fire being sure not to add too many too quickly or you could smother your fire. 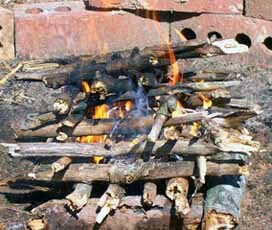 As mentioned, by building this type of fire, a very thick, hot and long lasting bed of coals are made. When you deem the fire is ready, just rake the coals somewhat level. you can place your cooking equipment, and certain foods directly onto the coals. This type of fire has many uses. 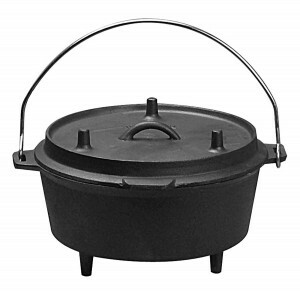 It provides a flatter surface for Dutch ovens, frying pans, coffee pots and other equipment that cannot be hung over the fire. The basic grill. There are again two types of grills I use. One is the above pictured stationary grill on legs and the second is a great little adjustable grill shown further down. 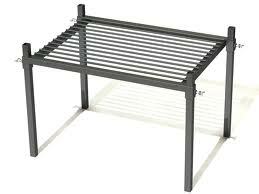 I’ve even seen folks use old oven racks as grills as shown below. The best way to use a flat grill without legs is to set it on top of two large opposing logs with the fire in between the two logs. 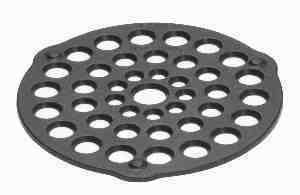 This not only holds the grill level and in place but reflects the heat into the center of the fire. Rocks can also be used but never use rocks taken from the water, they can explode when water that has soaked into the rock turns into steam. The adjustable grill. This is my favorite all purpose grill. 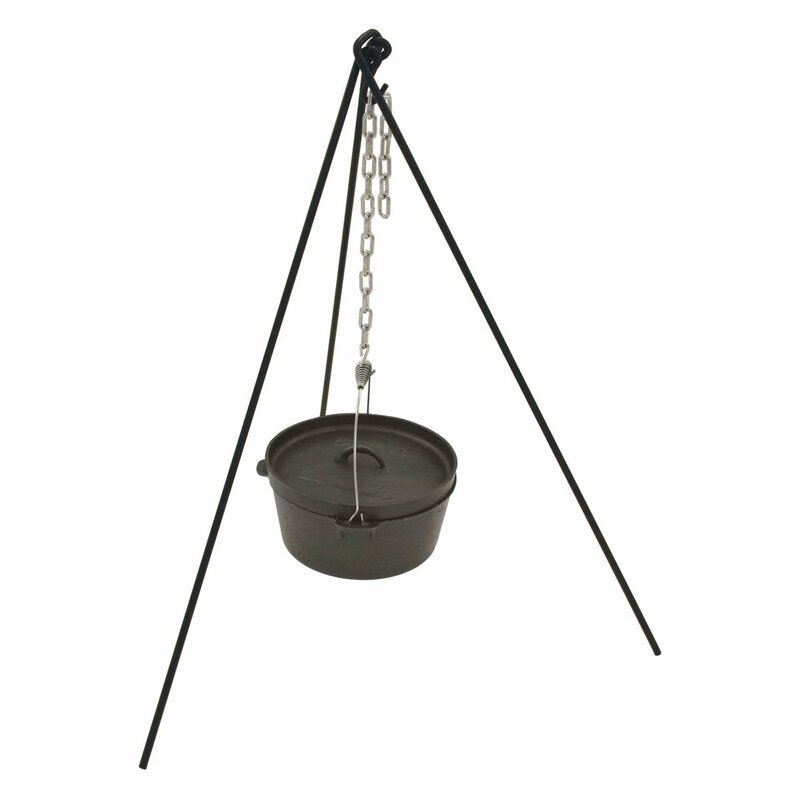 It’s mounted on an iron rod hammered into the ground and held in place with an attached clamp. 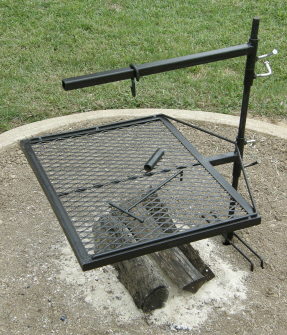 Being mounted on the rod allows the grill to be easily moved up and down and rotated away from over the fire. No more burning heat hitting your face when trying to remove your cooked food. Just rotate it 180 degrees away from the fire. 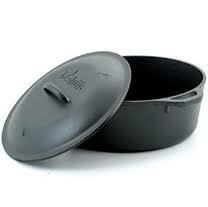 It will hold most frying pans, coffee pots or you can cook directly on top of it. 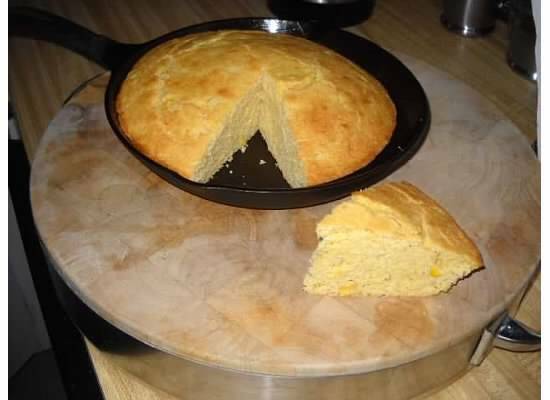 Potatoes, corn on the cob and even hot dogs, burgers and steaks cook easily on it. It dismantles and can be stored in its flat box. 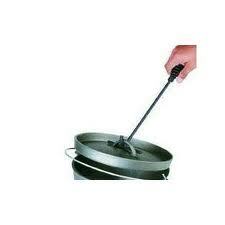 This inexpensive trail cooking tool is a must in my book. Finally, there are some optional pieces of equipment that are real handy if you are serving up food for a crowd but not necessary if you’re just a handful of hungry folks. I’ll go into further detail on these pieces of equipment in an upcoming Dutch Oven post. Below I’ve posted some pictures of these. They include a four legged Dutch oven cooking set, a coffee tilter and pot hanger. Other minor but handy stuff to have on hand are long handle tongs, a long handled basting brush, a iron lid lifter and gloves. I do not recommend using leather as heat transfers through leather quickly. Instead, I use Kevlar oven gloves. With the increased interest in self sufficiency and return to heritage cooking, trail cooking is an important skill to learn. 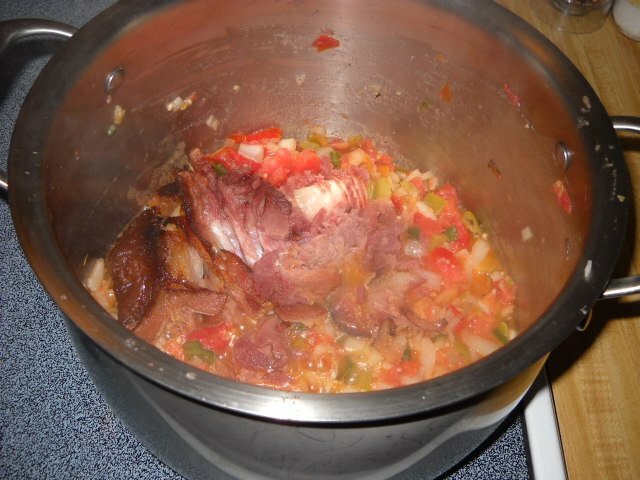 Many web sites have great recipes for this type of cooking and give great tips. If anything, a few tries will sharpen your outdoor cooking skills and give your ego a boost when you cook up a storm of great tasting meals for your friends. * How to make Carbon cloth. Take a 4-6 inch flat can that has a screw on lid on it. Using a nail, punch a hole or two in the top of the lid. Place some pieces of old cloth (6″ X 6″) into the can and screw the lid back on. Place the can over a campfire. You will see smoke coming from the vent holes. When smoking stops, remove the can and let it completely cool down. Once cool, unscrew the lid and you will find pure carbon cloth. 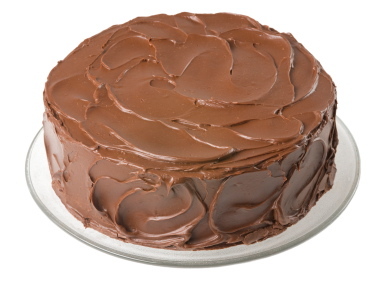 It is very flammable when struck by a match or spark and can be safely kept right in the can you baked it in.